If you’re playing with your family, the included cards are safe and generally fairly easy to translate from drawing to guess and back. If you’re playing with friends, have people write their own word or phrase. It’s generally more difficult to guess and I’ve seen far funnier outcomes with this method. One of the great things about this game is the use of dry-erase markers… until they run out of juice. Go out and buy a multi-color pack of dry-erase makers and add them to the box. That way people can choose more colors and if one marker dies, you’ve got another to take its place with no down-time. 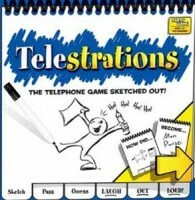 Telestrations is a great party game that can be played by pretty much any group, regardless of drawing ability (in fact, people that can’t draw at all – like me! – seem to enjoy it quite a bit). With all of the groups I’ve shown this game to, we’ve never found a need to worry about the scoring. Scoring makes the rules explanation longer (while without scoring discussion the rules can take under 1 minute) and increases the time before one game ends, and the next begins. Get all of the fun without the scoring/voting headaches. Skip the scoring and the enjoy the game! We don’t bother with the points at the end of each round, it is faster and funnier to be able to just see what other people draw. Rounds fly by and are enjoyable when you don’t have to decide who gets a random point. If you need to emphasize a specific part of a drawing, point to it with an arrow.